Returning Humboldt Broncos players Brayden Camrud (26) and Derek Patter (23) hug as they take part in the pregame ceremony before playing the Nipawin Hawks in the SJHL season home opener, in Humboldt, Sask., on Sept. 12, 2018. 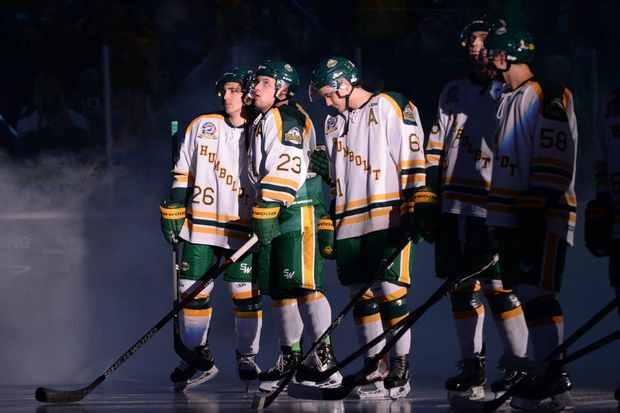 The Humboldt Broncos came up short in an emotional first regular-season game since the team’s bus crashed in April, killing 16. The Nipawin Hawks, last year’s Saskatchewan Junior Hockey League champions, rode two late second-period goals to a 2-1 victory. Humboldt’s lone goal came on a five-on-three power play early in the second. Eight of the surviving players who aren’t with the team anymore dropped the puck in the ceremonial faceoff before the game. 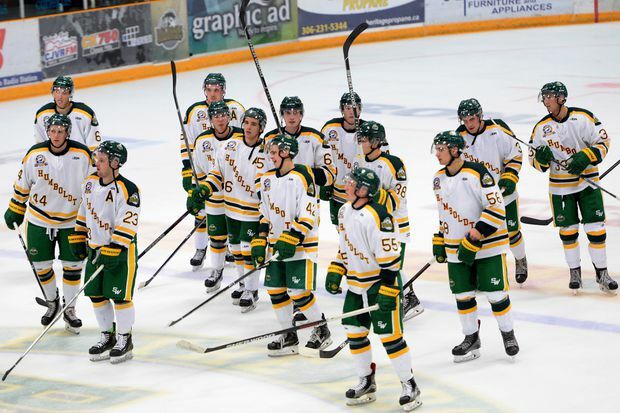 Humboldt Broncos players salute the crowd after their SJHL game against the Nipawin Hawks in Humbolt, Sask., on Sept. 12, 2018. Brayden Camrud and Derek Patter are the only two players who were in the crash and are back on the Broncos this season. 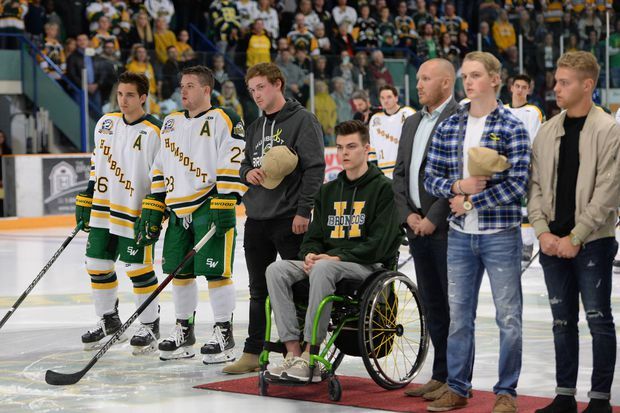 Returning Humboldt Broncos players Brayden Camrud and Derek Patter, far left, stand with other former teammates for the playing of the National Anthem during a pregame ceremony in Humboldt, Sask., on Sept. 12, 2018. “I think people were ... really looking forward to the season getting going and seeing the new team and seeing the results of a lot of work from a lot of people getting the team back on the ice,” he said. The opponents Wednesday, the Nipawin Hawks, were the same team the Broncos were travelling to face the night of the crash. 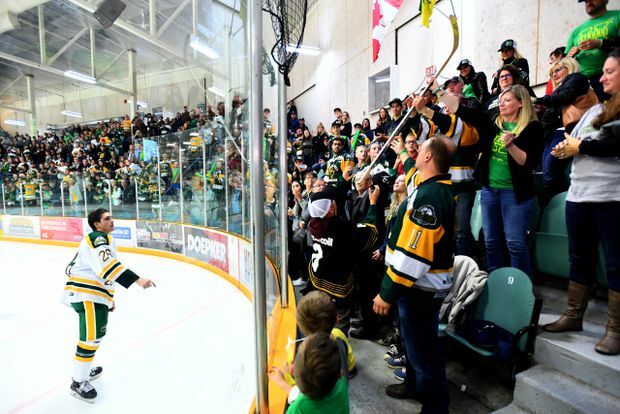 Humboldt Broncos forward Brayden Camrud passes his stick over the boards to fans after his SJHL game against the Nipawin Hawks in Humbolt, Sask., on Sept. 12, 2018.